A urine diverting toilet separates the feces and the urine from the beginning inside the toilet. With the same convenient use as a standard toilet you can achieve a lot of things by using a diverting toilet. You can choose by collecting the urine for farming and fertilizer purposes, or you can just use it for a water-saving purpose. Other dual-flush toilets can save some water, but a urine diverting one is the 10x choice for saving water and/or collecting the urine as a fertilizer. The EcoFlush is carefully designed and redesigned for many years with the goal to make the ecological experience as smooth as the standard toilet one. In the front bowl, the urine smoothly pours down besides the chrome lid, and in the back it works similar to a regular toilet. See the video above for a better look. Only flush where it´s needed. The average person does about 6 toilet visits per day, whereas only one of them is feces and five of them is urine. To clean only the urine bowl requires very little water - therefore the smartest way to flush is to direct the water where it is needed and not flush the entire bowl. The small flush comes from the front of the bowl, rinses the urin bowl and water trap – and some of the water smoothly flows over the edge to the big bowl. To maintain maximum hygiene it is key that some water pours over the edge to keep everything clean. EcoFlush does that. The big flush uses about 2,5 Liter and rinses the entire bowl including the urine part and water trap. The big flush is used similarly to a classic WC – but uses less water even on the main flush thanks to uniquely designed flush canals inside the ceramic. A regular toilet uses about 6 liters of water per flush. A large and unnecessary amount of water that is completely unnecessary. Nowadays, there are also dual-flush toilets called "low-flush toilets" which consumes 3 and 6 liters (small / large) flush or 2 and 4 liters. EcoFlush goes much further than that. Thanks to a unique design in the tank, flush channels and in the bowl, it uses only 0.3 and 2.5 liters (small / large). It gives an average of less than 1 liter per flush! A revolution in the toilet industry. Cost savings with EcoFlush to a 3000 Liter septic tank. Calculated with a 4 person family that uses the toilet 6 times / 24 hours. 1, 6 and 12 months. Currency is EUR. EcoFlush Saves up to 2400 Euro per year. Save a lot of money using EcoFlush to your septic tank. EcoFlush is the toilet that feels like a regular toilet, but consumes extremely low flush volumes. With a double flush function and a urine bowl in the front of the toilet, it saves up to 80% water. EcoFlush is primarily used for septic tanks, areas where you need to save on the water and to environmentally conscious households in houses or apartments. 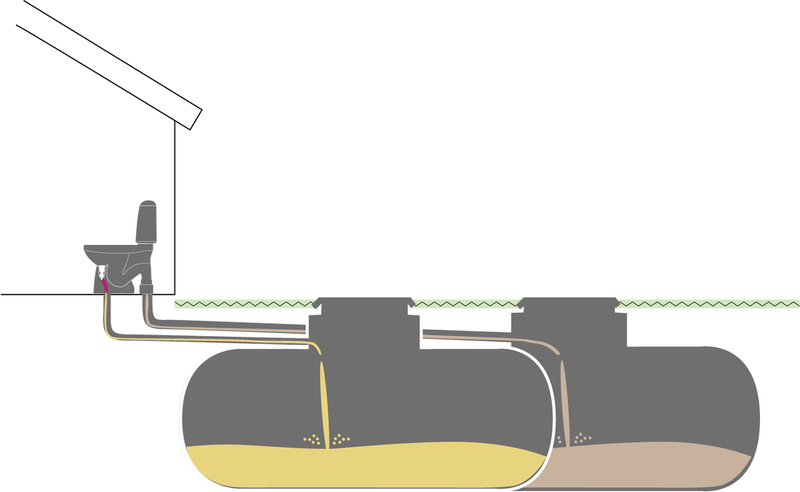 When using EcoFlush for septic tanks you can save a lot of money with fewer pick-ups of the waste. Most customers earn their money back in 3-6 months! EcoFlush is a unique toilet that makes water saving a blessing. See the charts below how much you can save! EcoFlush compared to classic “high volume” toilets like in the US, South Africa and other countries. Water consumed per week. Water volumes in liter. In a household of 4 persons (168 toilet visits in average). EcoFlush saves up to 2000 Liters per week in a regular household. EcoFlush compared to modern “medium volume” and so called “low-flush” toilets like in Scandinavia, Europe and other countries. Water consumed per week. Water volumes in liter. In a household of 4 persons (168 toilet visits in average). EcoFlush saves up to 700 Liters per week in a regular household. Yes. The EcoFlush is perfect for septic tanks and for individual sewages. Check your local municipality for regulations. Yes. EcoFlush is very easy to retrofit. Especially for 110mm outlets in the floor. Then you can use a WC-adapter for the urine hose to go in the same outlet. The EcoFlush is made for mainly two reasons. 1) To save huge amounts of water by using urine diverting to only get a “low flush” and then lead the urine back to the same outlet as the feces. 2) To be able to separate the urine all the way to separate tank to be able to use it as fertilizer or other possibilities. Yes. The EcoFlush is perfect for saving water anywhere. It can be installed both as a urine diverting toilet all the way to a tank or sewage, or, by using our WC-adapter you can easily place it where your old toilet has been installed or in a new house or bathroom. What is a urine diverting toilet? How does the unique flush works? How much money can I save by using the EcoFlush? How much water can I save with the EcoFlush? Can I use EcoFlush to septic tanks? Can I retrofit the EcoFlush to my current outlet? Why use an urine diverting toilet if they will go to the same outlet? Can I install EcoFlush in regular apartments and villas?